Many publications have compiled delightful music playlists to complement the holiday season such as the likes of Rolling Stone to USA Today. However, it seems everybody has been so caught up with asking the current music authorities of today and neglected to ask one of people primarily responsible for the cheer and holiday spirit present during the holidays… Santa Claus himself. So we took it upon ourselves to ask Santa to reveal his favorite holiday tunes he listens to while laboring away at planning his delivery route for his “nice list.” Luckily, he was willing to sit down and talk to us about some of his favorite tunes despite the tight demand that the holiday season brings and his evasive and mysterious nature. Below is a list of Santa’s Top Ten Christmas CD’s. Songs that have withstood the test of time and continue to be Santa’s favorites. These are the songs on Santa’s very own I-Pod, plugged into his sleigh on Christmas Eve. They’re tunes his reindeer are tapping their hoofs to while flying around the world during their evening delivery. 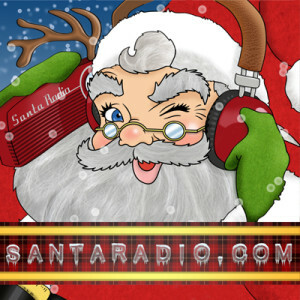 Some highlights of Santa Radio’s playlist include the lovely, warm melodies of the Carpenters to the timeless and classic signature melodies of Frank Sinatra that conjure up images of incandescent Christmas trees, painted candy canes and snow covered homes adorned with brilliant and colorful lights. Santa Radio’s Top Ten Music list will capture the spirit of the holidays with Mariah Carey’s chart topping hits that have been holiday favorites for years to a favorite of Mrs. Claus (don’t get Santa started), Michael Buble’s beloved and current renditions of classic magical Christmas standards perfect for putting anybody in the holiday and Christmas spirit. See for yourself what Santa loves to listen to during the holidays and maybe your Christmas may be a little brighter. May Santa’s Christmas music playlist capture the loveliness and splendor the holidays always captures. The holiday spirit is filled with love, joy and peace and color, so Santa Radio’s music playlist will serve as the perfect backdrop to your favorite part of the year. Santa shared his reasons for his favorite music selections in this rare interview. And remember, if you don’t agree with Santa’s favorite music list, he might be checking another list more than twice! See if your top ten holiday and Xmas music makes Santa’s list here.